A modern roundabout is a type of intersection design in which traffic goes in one direction around a central island. Los Alamos already has a roundabout at the end of Diamond, past the golf course. When compared to signalized intersections, modern roundabouts decrease crash rates for motorists and pedestrians, and improve traffic flow. Modern single-lane roundabouts are part of all "A" options proposed for Trinity. In these configurations, roundabouts work to smooth out traffic flow and lower end-to-end travel times (no red lights), improve pedestrian access (only one lane to cross at a time), and decrease maintenance costs (no electronics). Why are they being proposed? Roundabouts are proposed in the A1 and A2 options as part of an entire treatment including a through lane with turn bays, bike lanes, and a landscaped buffer between sidewalk and pavement. Because of the single approach lane in these designs, single-lane roundabouts are feasible. A "through lane", which never has to stop for turning traffic in the provided turn bays, keeps traffic moving at a constant speed (no red lights). Roundabouts at intersections maintain a continuous flow, instead of "bunching up" cars like what happens at traffic lights. Because cars don't bunch up, mid-block turning traffic typically has more windows to turn, meaning no pile-ups like what happens on weekdays at 12:50pm in front of the hospital. This is how the roundabout designs are able to handle peak traffic without degradation over the current design. The roundabout designs offer a way for drivers on side roads like Oppenheimer and 20th to turn onto Trinity during peak times without needing traffic-bunching signals. Because of lower speeds, reduced angles, and a vastly reduced number of "conflict points" (see figures), they also reduce the number of collisions by up to 40% according to one study. Those collisions that do occur are 80% less likely to have injuries and 90% less likely to have serious injuries. Roundabouts provide an important additional benefit: pedestrian access. Because a pedestrian at a roundabout only has to check for cars in one direction at a time in two conflict points per crossing, as opposed to the 6 pedestrian-car conflict points in a signalized intersection, pedestrian safety is greatly improved. Roundabouts are being proposed, then, because of better flow, improved safety, and pedestrian accessibility. Many feel that because they can be landscaped, they are also more attractive than steel signal posts and hanging lights. In order to construct a signal at an intersection, that intersection must meet one of several warrants established in the Manual of Uniform Traffic Control Devices (MUTCD). At current and predicted volumes, no additional intersections on Trinity meet these warrants. One way for a fourth Trinity intersection to meet a warrant would be by having more wrecks at an intersection, but as yet no one has volunteered to assist with this. Because we can't build any more signals, the only way to address the poor current pedestrian access would be to build crosswalks. But studies have shown that at the speeds along Trinity, drivers rarely stop for pedestrians. This well-understood fact is why a tunnel was built to connect the golf course across Diamond. But any new tunnel or bridge, in addition to costing millions, would need to meet ADA requirements, and there's not enough right-of-way to do this. In creating this page, we scoured the Internet for work other cities and states had done to educate people about roundabouts. In doing this it became clear that the concerns voiced by some in our community are not unique to Los Alamos, and that these concerns largely disappear after the roundabouts are built. 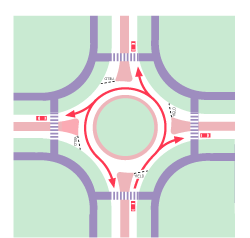 The state of Alaska has a good page about roundabout myths vs. fact, and our own FAQ addresses specific questions that have emerged in Los Alamos. Because roundabouts are being installed in so many locations throughout the country, it's difficult to find educational material about only the single-lane roundabouts proposed in the A options for Trinity. Fortunately, the principles are not very different. Roundabout: a 6-minute video about a small town that replaced a signalized intersection with a roundabout. There was widespread opposition to the roundabout, but after it was built, everyone loves it. All About a Roundabout is an informative short video from the Missouri Department of Transportation. Wikipedia's Roundabout article contains good information not only about the safety and performance of roundabouts, but also public opinion and how modern roundabout design has come about. This is just a sampling, there are far too many to list them all. Most, probably all, states have built roundabouts and are considering more. This list only includes the state-sponsored pages about roundabouts that we could find. Jan 19, 2012: Transportation Board meeting to make a recommendation to council based on TAC review. Planning Streets for an Aging America by AARP reinforces some of the main reasons people want to change Trinity. Roundabout Video: Initially, the "whole community" was opposed, but now everyone loves it. Don't Be So Square: the debate in our town is hardly unique.